Glacier’s a big park. And while the main road that runs through it―Going-to-the-Sun-Highway―is amazingly beautiful, it takes some time to drive. So your ideal three days will focus on three different regions in the park. Early mornings on horseback. Join Swan Mountain Outfitters for a ride among the beargrass from Apgar Corral through sun-dappled lodgepole to the Middle Fork of the Flathead River and McDonald Creek’s oxbow. Take a hike. Hike the half-mile Trail of the Cedars, bordered by ferns, western red cedars, and red argillite rock accompanied by the sounds of Avalanche Creek’s tumbling waters. Be historic. Check into one of the 100 rooms at the historic timbered Lake McDonald Lodge with its enormous lobby featuring elk and caribou trophies and a massive stone fireplace with pictographs. A Red Jammer bus alongside the Wailing Wall on Going-to-the-Sun Road. Take a twilight drive. Ride through the dusk in open-air red buses (driven by drivers nicknamed “jammers” ) from Lake McDonald Lodge to the 6,646-foot Logan Pass to see moose and mountain goats. Sip a Moose Drool. That’s one of the microbrews in the cozy Stockade Lounge, before digging into grilled trout with capers in the cedar-planked dining room overlooking Lake McDonald. Take the most spectacular drive in the world. Wind along the breath-snatching Going-to-the-Sun Road, a geological triptych past hanging valleys, waterfalls, cirques, and cloud-piercing mountains including Heavy Runner, Clements, and Bishop’s Cap. High ecology. Take in the display on alpine ecology at Logan Pass visitor center then see the alpine ecology itself: glacier lilies, the krummholz-looking subalpine fir, and algae-stained pink snow. Lake cruise. 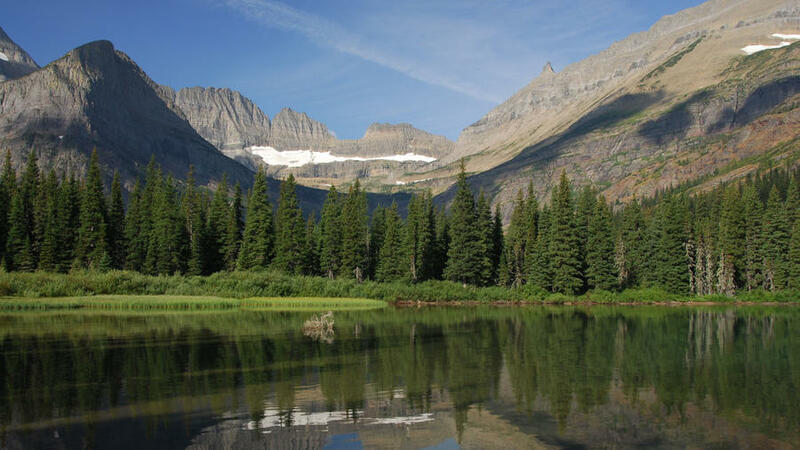 Board a boat to cruise 45 minutes along Two Medicine Lake, shadowed by 9,513-foot Rising Wolf Mountain, then hike 1.8-miles roundtrip hike to the Twin Falls spur trail. The ambitious can add on the 4.4-mile round trip to Upper Two Medicine Lake. Break homemade bread. Have lunch at Johnson’s café, open since 1951, just outside the park in Saint Mary. Open summers, the cafe is known for family-style meals of homemade soup, and fried chicken. Hear a music man. Collapse on a sofa in the Swiss-style Many Glacier Hotel to hear fringe-jacketed David Walburn croon about Montana mountain men, explorers, and wildlife (nightly except Sundays). Boat and hike. Board the boat tour from Many Glacier Hotel dock that crosses Swiftcurrent, then Josephine lakes and hike 8 miles in spectacular alpine country to the park’s popular Grinnell Glacier. For an easier excursion, take the same boats, but try the 1.8-mile Grinnell Lake hike. Go Wild West. Belly up to bar in the Empire Lounge with its wooden stools in the 1913 Glacier Park Lodge in East Glacier, with its lobby studded by buffalo skulls and 30 52-foot Douglas fir columns. Try the wild game sausage plate in the dining room or feast on barbeque and cherry crisp at Cowboy Cookout (Tues. and Wed.).